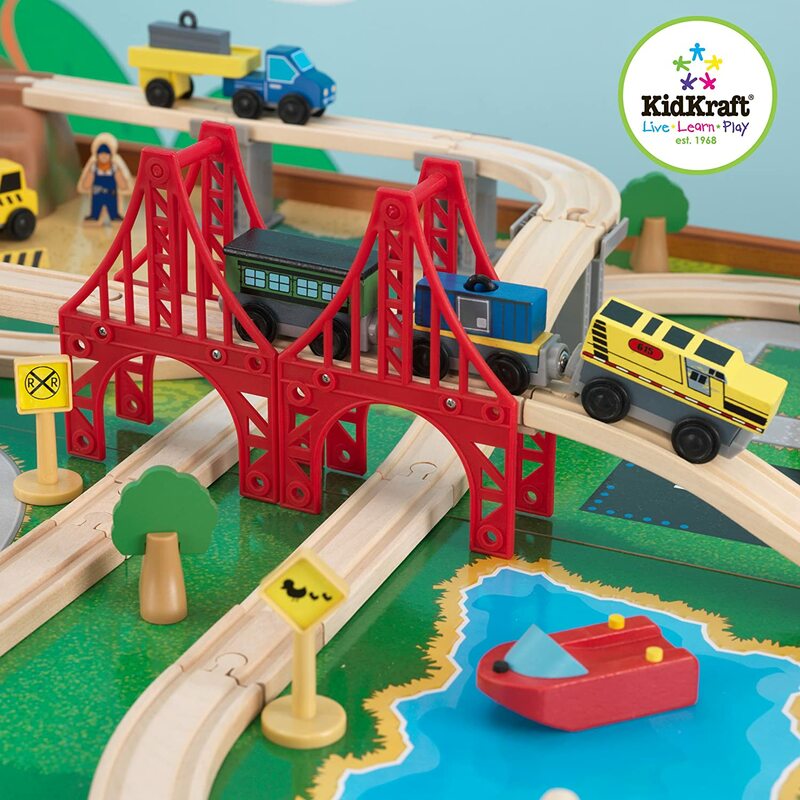 KidKraft Train Sets Add to Flipboard Magazine. I can remember when I was a little girl that we had a pool table in the basement. But you couldn’t play pool on it because my dad had his model train set all over it. He loved that train set. I had forgotten about that train set till just now. Funny how memories come and go. Train sets have been around forever and kids of all ages still love them. There are train sets made just for toddlers, the pieces are big so their don’t choke on them, and then there are train sets for older kids with lots of pieces. Depending on where you kids are is what you would want to look at. You will notice that some come with tables for them to set on, while others don’t. So be aware of that. Let’s take a look at a few now. This is a colorful, real-world environment, the Ride Around Town Train comes with a large landscape board setting. 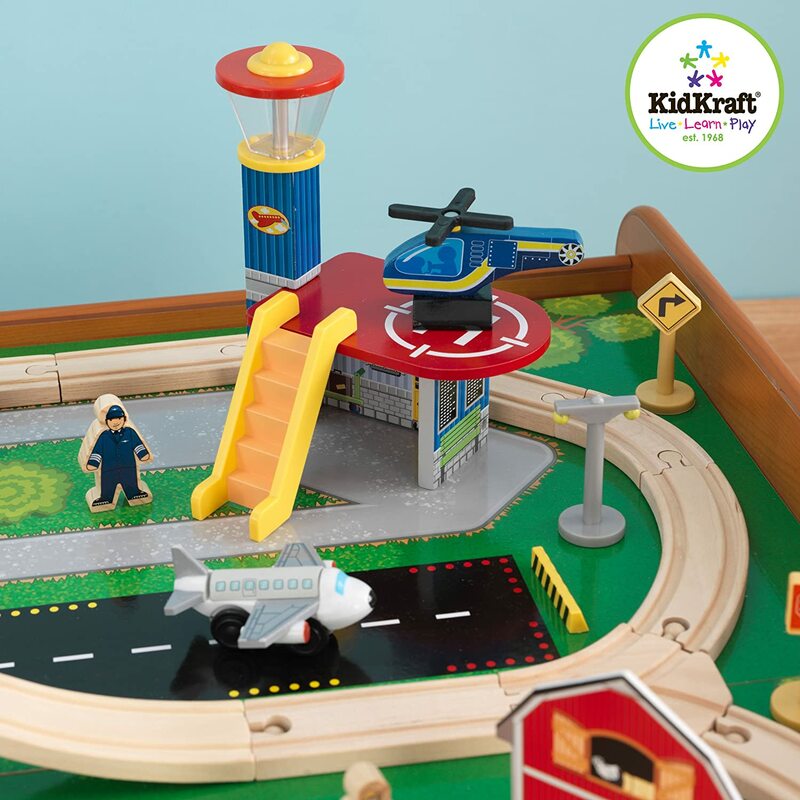 It is a highly detailed board which features lakes, bridges, pastures, and an airport runway. There’s even an area to place a plastic mounting setting with a moveable crane and working winch. The small wooden track pieces fit together with simple tongue-and-groove connections, allowing for easy, custom assembly. Support beams and bridges make it possible to arrange the track in a raised, crisscrossing configuration for multi-level fun. You can link the tracks in many different ways with the pieces ranging from straight to curved to inclined. The table top measures 49 x 34 and stands 16 inches high for easy playing. This is the perfect set for a toddler. Everything fits into a small, tidy bucket. Now if you can just get him to pick it up when he is done. There are 56 pieces. Long, winding track, and a molded mountain with two waterfalls, a lake and the mountain doubles as the lid of the bucket the train set stores in. There is a fire truck and police station for added fun and adventures. 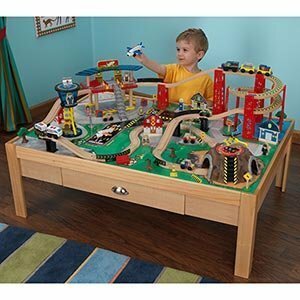 Large train set that allows several children to play at the same time without being crowded. 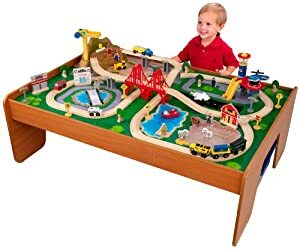 The table that comes with this train set is made of good solid wood and is on rollers so that it can be rolled away and out of the way when your child is done playing. 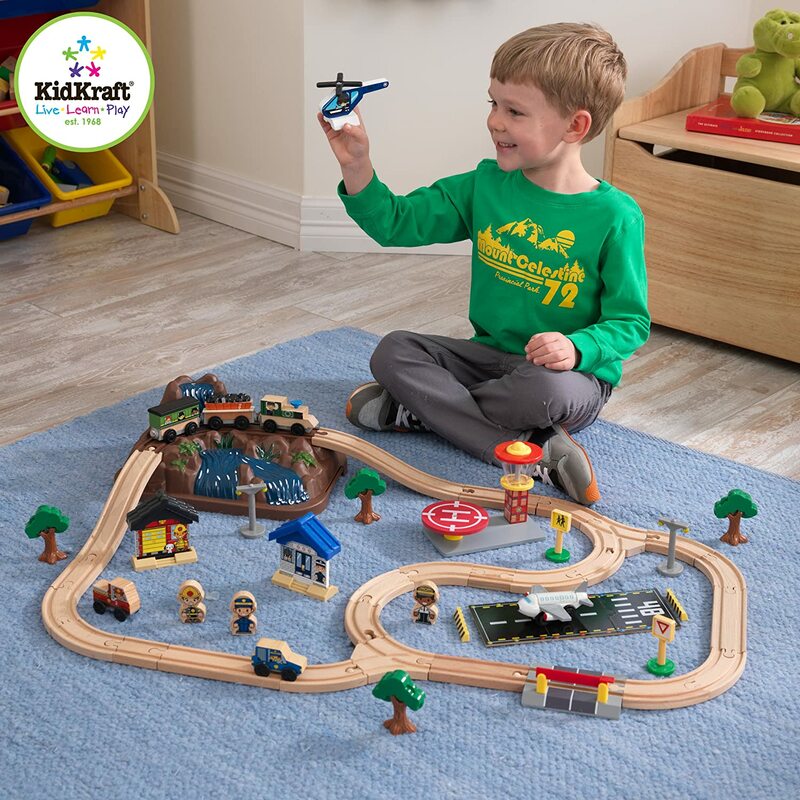 This set includes a 100-Piece Train Set, Two-Tier Bridge, Mountain with Drive-Through Tunnel, and an Airport with a Helipad. It measures 46.5in Long x 32.75in Wide x 26.63in High. smiling farmers, three horses, one chicken, one pig and one cow…how can your child not have a great time playing with this Farm Train Set? 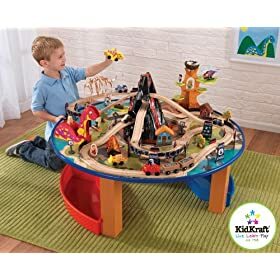 It has 75 pieces that make this train set so easy to set up and play with and then change your mind and move it all around. This would be a perfect gift for a first time train set owner. He or she will delight at the brightly colored pieces and how close attention was given to details. 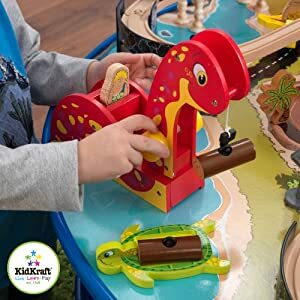 For something a little bit different, how about a Dinosaur Train Set? It has a 95-piece train set, with long, winding track. The train cars can pass through the volcano from 6 different angles. There are five smiling cavemen and cavewomen to play with. Check out the prehistoric police station and fire station. There are moving dinosaur crane lifts and lowers heavy logs. 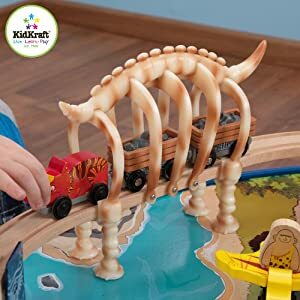 The bridge cover is made of dinosaur bones. I love the circle table as well. I really like this set! 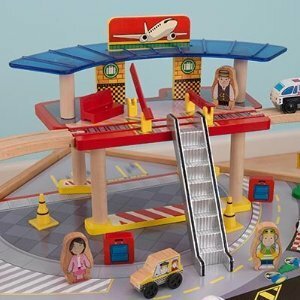 What do you think about an airport train set? It has all you would find at the airport, plus a train. 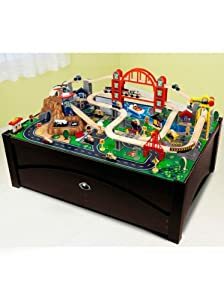 First it comes with this fabulous play table that has a built in drawers for the train pieces and the top is reversible. Love that! This is a 100-piece train set that has a drive-through mountain with helipad. There is a three-piece train, four cars, two airplanes, two tram cars and a helicopter. The exclusive spiral track piece is compatible with Thomas & Friends® and Brio® wooden train sets. Now that was a good idea! Ok, enough trains for today. If you have not seen something you like, you can always go to Amazon.com to see more.